Well, I guess you've seen other web sites, maybe read some books and probably know of the 4000-year history of falconry, the tradition and the modern day reality so I'm not going to bore you with my version. What follows are simply some thoughts of my own, thoughts that you may choose to ignore or indeed, may make you laugh out loud. My thoughts and experiences nonetheless. I ask nobody to accept my views. I ask nobody to follow my advice. I ask only that, having come to this page, that you might care to take the time to read and consider the following and if you gain something from it then my efforts have not been in vain. Falconry is, and always has been a most demanding sport. Demanding of your time, patience and dedication it can be achieved to a high standard or it can be toyed with, (at your peril) as it pleases you. At the very highest standard it will take your breath away, with its bursts of adrenaline pumping action, often followed by lengthy spells of inactivity. It can appear brutal and beautiful at the same time, as you watch a natural predator, matched evenly against fit and healthy natural prey. The bird you fly maintains a large degree of its wild instincts but it can, and handled correctly will, offer you its trust. There is no more beautiful feeling than the knowledge that the falcon that is a mere speck in the sky high above you, will in due course, return once again to reside on your fist, when it has the freedom of the skies and the ability to depart at any time it chooses. Or the hawk mantling over quarry that will allow you to 'share' its kill. Conversely, if you get it wrong the result can be serious injury, loss of your bird or both, a scenario that is heartbreaking at best. Good training is essential, a bond made by food and feeding is a must but I believe that trust is of paramount importance. To scold a bird is pointless; to hit a bird is courting disaster. If you are considering falconry as a sport, I think it most important to discuss the matter thoroughly with your husband/wife or partner, as only the most understanding souls will accept the amount of time spent with your new acquisition, and it will very likely get worse as you progress! A part of your garden will need to be given over to an aviary or weathering and a chunk of your heart will go to your bird. It cannot be stressed strongly enough the importance of good, sound training prior to the purchase of your bird. Books are a great source of information, some being better than others, but nothing can beat hands-on experience with an experienced falconer by way of an apprenticeship or club mentor. Within the links section you will find some suggestions for good reading to help you on your way, along with insight days and training courses. When asking questions of anybody, remember that your most often asked question should be "why?" You may be told that to achieve a certain goal within the training of your bird, that you can accomplish it by doing something in a certain way. Why? Answers such as 'because it's always been done like that' or 'because that's the way I was taught' are in my opinion simply not helpful. Why has it always been done that way? Why were you taught to do it that way? What is the reasoning? Generally, this line of questioning will sort out the natural and knowledgeable teachers from the would-be teachers and the ever-present 'overnight experts'. It's also quite likely to drive your mentor up the wall, but your learning curve will be much enhanced. It is probably worth remembering that to profit from good advice takes more wisdom than to give it. The day will come when you are considered ready to own your first bird. If we consider that your falconry course is completed, accommodation is constructed and equipment purchased, where do you start to look? Once again, you can look to your friendly local falconer or falconry club for help. The IBR Directory is also a mine of useful information. Take care! Since breeding birds have become more prolific and the science involved somewhat less mysterious, there are far more birds on offer than ever before. Many birds will be sound, some less so. 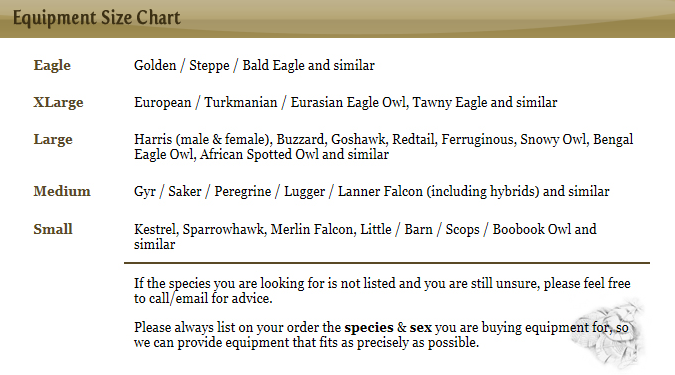 Always ask a number of questions, most of which should be related to the parent birds rather than your intended purchase. Origin of parents? Are they legally held in captivity? Do they both carry a closed ring with numbers corresponding to any relevant paperwork? Do they have Article 10 certificates or registration documents where applicable? Parent rings numbers? Are they similar? Could it be that the parents are related? Have the parent birds been hunted? Were they intelligent hunters? At what weight did they fly? What quarry did they take? These questions should help you to assess the likelihood of your birds' ability with correct training. How much experience has the breeder got in breeding these birds? What diet have the young been fed? Age of youngster? No bird should (in my opinion) leave its parents before it is 18 - 20 weeks old although there are exceptions to this rule with certain species such as the Goshawk or for imprinting purposes. Is it cr�che reared? Is it parent reared? These birds are generally the better adjusted and quieter of birds. A good breeder should be fully prepared to supply you with a document to accompany your bird, upon which, much of the above information should appear. Some breeders will also offer a refund or exchange if for any reason you are unable to get along with your chosen bird or if it has been incorrectly sexed. This of course, will have a time limit attached. A worthwhile expenditure would be to have the bird checked over by an experienced avian vet prior to parting with any money. Fact: It is a sad fact that some people are not strictly honest with their answers! Buyer beware. What do I wish to achieve with my bird? Do I wish to hunt with my bird? What land do I have permission to fly over? Do I have sufficient land and permission? What legal quarry species do I have locally and expect to hunt? Am I prepared to travel to find suitable land and/or quarry? How much time do I have for exercising and hunting my bird? Am I really only able to fly at weekends? The answers to these questions should help you to assess your best choice of bird�again, with a little help from your mentor. When you first arrive home with your new bird your top priority should be to get the bird fully equipped. Many breeders will put aylmeri anklets on birds that are being collected and some may supply jesses, swivel and leash. Others will throw the bird in a box, take your cash and say goodbye. The essential equipment required on that first day should consist of aylmeri anklets, mews jesses, permanent flying jesses, (if required) a good stainless steel swivel, leash, tail mount, bells and a well fitting hood if you intend hooding your bird. If all this equipment is fitted on that first day then the most stressful time for the bird is out of the way and you can start manning and building a relationship. Some people will tell you to let the bird settle in for a few days before fitting equipment. Why? (remember the section above on Training?) Imagine the scenario���.the bird starts to settle into its new surroundings and show a degree of trust, at which point you grab it, physically pin it down and spend 20 minutes working on it. You work out where the story goes from there! Your new bird will require a settling in period (although not necessarily essential) to get used to its new mews, equipment and handler. It will also require feeding well as many birds do not leave the aviary at their top (fat) weight due to competing with their parents and siblings for the available food. Although food should be offered every day, it may be the case that your new bird does not eat for a few days during that �settling in� period and any uneaten food should be removed the following day and replaced with fresh food. Good quality food is an essential for any young growing bird and can be accompanied by a vitamin/mineral supplement and a probiotic supplement. These products are beneficial for good health throughout the life of the bird and it is wise to continue this practice. Note: It is often beneficial to feed your bird through a feeding shute or hatch in the first few weeks so that the bird does not see you as the food provider and become imprinted. Although this scenario is unlikely with a 18-20 week old bird it does occasionally happen. Cutting weight from the bird is an essential part of training but should not be implemented too soon after collection. Why? Would you put a new born baby on a diet while it is still growing and developing? No! Your bird may well have a life span of 25 years so there�s no rush to get it out and hunting in days. Take your time, do it properly, get your bird fully fit before putting it against quarry and reap the long-term rewards. Always remember with a new bird to approach it at low level so as not to tower over it and frighten it. If this means crawling across the aviary on your hands and knees then so be it. When the bird is fully accustomed to your approach and indeed looks forward to it, then it is acceptable to approach while standing at your full height (unless you are 6ft tall and your mews is 5ft high!). Manning can commence at almost any time and it is important to gently and carefully expose your bird to everything that it can expect to see in the normal course of a day. Socializing with humans, dogs, horses, sheep, cows, cars and tractors can be done successfully and with care in the first week or two. (Is it possible to socialize with a tractor?!) Bating (flying from the fist whilst being held) should be avoided at all costs if possible. All manning and early training can be achieved with the bird at full fat weight, therefore putting off the need to cut weight too soon. With your bird manned and comfortable on the glove it is time to start feeding on the fist. When the decision is made to start, that then becomes the ONLY place that the bird should feed. If it refuses to feed on the fist then no food should be given until the next session on the following day. This is an unlikely scenario with a 5 month old manned bird but be aware that it is a possibility. Further training can commence once your bird will stand happily on the glove and feed, apparently oblivious and untroubled by your close proximity. Now speak with your mentor for the next steps in training. Good luck. Walking birds through high street? This is a rather sad trait that has developed in the bird keeper who feels the need for an ego boost. There is no good or logical reason to take your bird to busy public places for the purposes of exhibitionism. If you are an exhibitionist then try dropping your trousers in public, this will do the sport of falconry no harm and give somebody a laugh at the same time (it may also get you arrested but that�s your problem!). Please remember the public image of falconry/bird keeping. If it is done correctly, with care and sensitivity you can do endless good, conversely, if it is done incorrectly and without thought for the consequences, great harm can, and possibly will, result. After all said and done, you will never please and/or convince everybody of your good intentions for your birds' wellbeing, or that the practice of falconry is a 'natural' field sport of which we are privileged spectators and participants. Please treat all quarry species with respect and do not pursue relentlessly. If your bird has failed to make contact and hold its quarry, why not allow the quarry to enjoy its victory and move on. Your bird will be better for the experience and the quarry a more challenging adversary in the future. Dispatch quarry humanely and swiftly. It will be considered cruel to allow your bird to kill its prey at leisure. If you feel unable to undertake this final merciful act then considerable thought should be given to whether hunting with a bird of prey is really for you. It is also most important to make yourself conversant with, and observe, closed season dates on certain quarry species. They are in place for a reason. It is important to treat all land over which you have permission, with care and consideration. If you have been granted trust by the landowner, to abuse it is to put in jeopardy your future sport and the good reputation that falconry currently enjoys as a field sport. Written permission is always useful in the event that you should be challenged by a farm worker or member of the public. It is not unusual to hear of falconers being responsible for untangling a sheep from a bramble patch or barbed wire fence, reporting sick or strayed animals to the landowner, a broken fence or even poachers! These actions take little of the falconer's time but can count greatly in your favour when the landowner can gain some benefit from your presence. Finally, don�t forget the landowners who have granted you permission when it comes to Christmas � even a small gesture can go a long way! And finally, I wish you all, experienced and novice falconers alike, rewarding and happy hawking and I look forward to a visit from you, electronically or in person, if I can be of service.